After an abysmal start, New York’s fledgling medical marijuana program is finally building momentum. Since late January – shortly after the first dispensaries opened – the number of registered patients has grown by an average of 32% a month. There are now around 7,600 medical cannabis patients in the state, up 1,500% from 481 nearly eight months ago. But the overall total remains small relative to New York’s market potential, and the state’s licensed medical cannabis companies are still struggling. 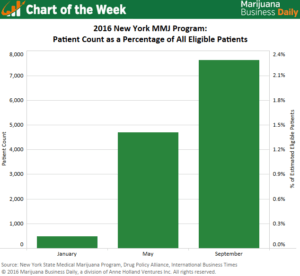 New York’s MMJ program began registering patients in December 2015, and the first dispensaries opened in January. Those businesses experienced weak initial demand because only a few dozen patients had registered as of opening day. While it’s difficult to know just how many New York residents can qualify for MMJ based on the state’s current list of qualifying medical conditions, a recent Drug Policy Alliance report estimates the number is between 200,000 and 500,000. Splitting the difference would mean that just 2.2% of an estimated 350,000 eligible participants are currently enrolled in the MMJ program. Many factors have contributed to New York’s relatively low patient count, including a limited qualifying condition list, a lack of patient access to doctors that can recommend MMJ, a narrow and pricey selection of cannabis products, and a finite number of dispensaries. Matt Karnes of GreenWave Advisors, a New York cannabis consultancy, believes the growth in patients reflect increased patient awareness and the addition of more doctors throughout the state who are authorized to recommend MMJ. Increase the number of licensed MMJ businesses to 10 from the current five. Streamline restrictions on producing medical cannabis. Allow home delivery of MMJ. Permit nurse practitioners to certify patients. While many in the industry view these proposed changes as business-friendly, they may not be enough to reassure existing business owners. In a May interview with Marijuana Business Daily, Hillary Peckham, COO of Etain Health – a licensed New York MMJ business – said Etain would need to see between 1,500 and 2,000 patients per month to cover costs. The latest state data indicates approximately 40% of registered patients visit a dispensary each month, and with five licensed businesses splitting this group of patients the pool will need to grow much larger before companies reach a point of sustainability. Bloomfield Industries – another licensed New York MMJ business – apparently is already feeling the financial squeeze. 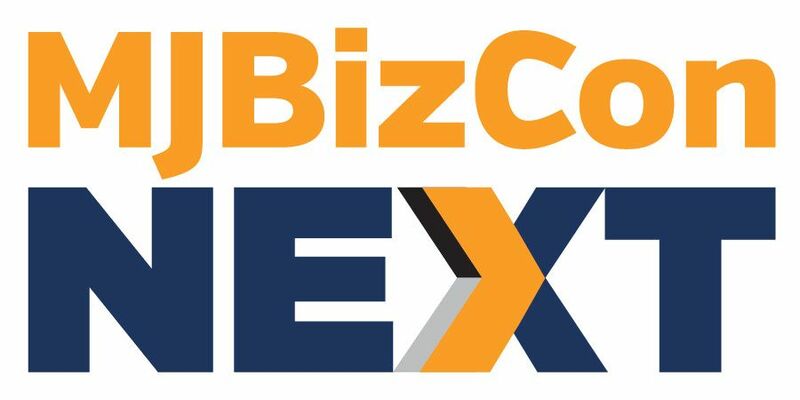 According to a recent Politico article, the company stated that it’s facing “financial constraints,” forcing executives to skip payments to vendors and entertain offers from a range of investors. While the future of New York’s MMJ program is uncertain, it’s clear that the status quo will not suffice for current business owners looking to turn a profit. As a New Yorker, I see our biggest problem being Gov. Andrew Cuomo, who arbitrarily imposed upon NY medical cannabis companies the economic stagnation of “vertical integration.” A paltry 5 businesses (out of 43 total applicants) are forced by NY’s 2014 (Un)Compassionate Care Act to grow the cannabis plants, extract oils from their seedless female flowers, then to manufacture, distribute and sell the non-smokeable products through no more than 4 storefronts each (3 out of 20 storefronts allowed statewide are clustered in the capital, Albany, alone). Cuomo’s blatant political interference—based upon his ridiculous belief that “marihuana” is a “gateway drug” and must be so tightly controlled—has ruined this whole process from Day 1. The result is that many current patients say the limited products available are virtually impossible to afford, at nearly $12,000 per year (not covered by any insurance). Plus, just last January, Cuomo’s chosen NYS Health Commissioner, Dr. Howard Zucker, left many thousands more patients in the lurch by coldly rejecting the addition of 5 qualifying medical conditions, including PTSD and Alzheimer’s, to the current list of 10, citing insufficient “evidence.” The arrogance of these two men, ultimately, forces thousands of New Yorkers to take the risk and grow cannabis plants themselves, regardless of the fact that such plants are still being aggressively hunted down by the New York State Police, the Drug Enforcement Administration and 62 county sheriffs. The war on “marihuana” rages on here in backward New York, I can assure you, where compassion toward cannabis consumers simply does not exist. Go NY Go NY Go!!! Cannabis and Hemp Association loves you.